This is actually one of those Dorling Kindersley Eyewitness Books aimed at school-age children. A few weeks ago when the kids were on Spring Break we found ourselves in a quaint little bookshop in Lake Geneva, Wisconsin, and I bought my daughter the one on Cats. On the interior front cover and title page, they show the covers of all the other Eyewitness books and I saw the one on Goya. "Goya," I told my son, who wanted an Eyewitness book of his own, since his sister had gotten one. "You should get the one about Goya." I knew next to nothing about Goya, other than that he had painted all those dark and foreboding "black" paintings on the walls of his home near the end of his life. A few days later, when we were back home at at our local library, I saw the very book I mentioned, and we checked it out. The format of these Eyewitness books makes it really hard to keep track of and retain a coherent narrative. Each spread is about a different facet or period in Goya's life, and each contains more a smattering of pictures and captions than any real expository information. 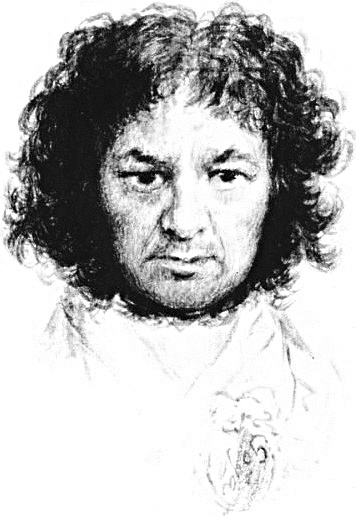 After reading it through I know that Goya lived an extremely long life, that he enjoyed alternating periods of wild popularity and practical exile, based on the shifting political winds of Spain and Europe in the 1700s, and that many of his paintings were deeply allegorical, often twisting the classical themes that possessed other painters to mimic the political caricatures and issues of his day. The greatest and most disturbing (in my opinion) of all his black paintings, Saturn Devouring His Children, can be viewed as an allegory on the situation Spain was then facing--a series of brutal wars and revolutions that were devouring its own citizens with the same blind madness that grips Saturn's face in Goya's great work. He promoted a decided anti-war theme in countless other etchings and paintings, and produced several famous series of prints that showed the ruthless and violent reality that few other artists of his day dared explore. Another great theme was that of sorcery and witchcraft, where Goya allegorically attacked the practices and beliefs of the Catholic Church and its Holy Inquisition. 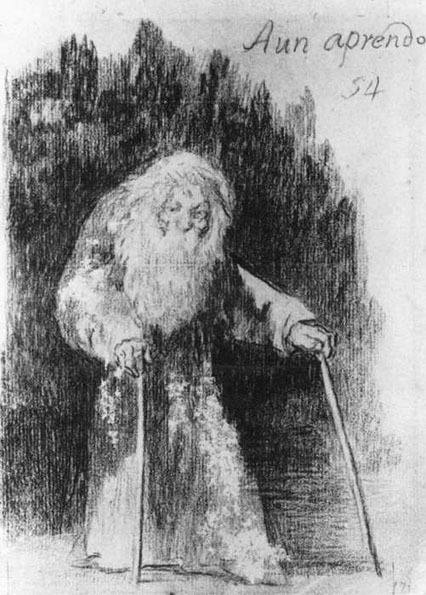 A sentimental favorite of mine is one that Goya sketched near the end of his life. Aun aprendo, it says in the upper right-hand corner. "I am still learning." 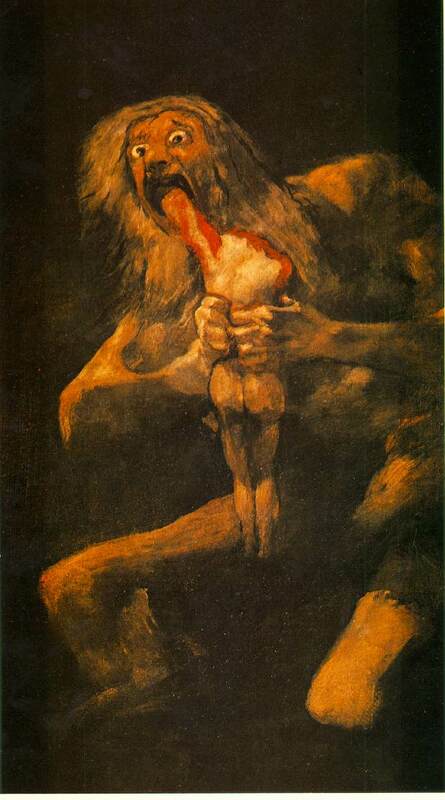 Given everything I read about him, and the scope of experimentation he showed throughout his career, I imagine it is very much the way Goya must've felt when he drew it in his seventy-ninth year. Shouldn't we all be thus? Tottering forward on our two canes in our old age, still eager for the next opportunity to learn something new, open to all that life has yet to offer?